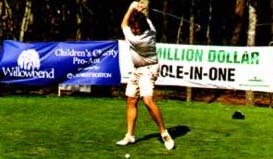 Hole-In-Won.com's MILLION DOLLAR SHOOTOUTS offer a your tournament participatory excitement that is unparalleled in the sports world. 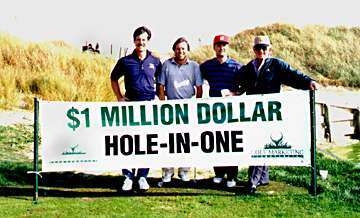 Any golfer - of any level of skill - can take home $1,000,000! The Qualifying Round begins with the contestants driving 130 yards toward a pin. Those whose balls land within a six foot circle of the pin advance to the Championship Round. The five golfers closest to the pin in this round become the Finalists. The Finalists receive one ball and one shot at a MILLION DOLLAR HOLE-IN-ONE! 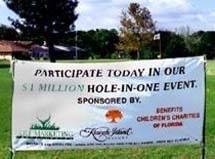 The average participant purchases $5.00 worth of golf balls, making it easy to see that your organization can make a large profit on this high-profile event. And then there's Sponsorship money... These MILLION DOLLAR SHOOTOUTS draw top dollar from corporate sponsors as a way to publicise their activities and committment to local communities - you can get a dozen or more sponsors for an event of this type. The sponsors pay advertising fees based loosely on the amount of publicity they receive from the tournament.